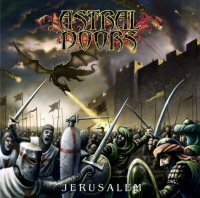 To be honest, when I was asked to review an album called ‘Jerusalem’ by a band called Astral Doors I was wary that it might be some drippy hippy religious twaddle, which will be a laugh to any fans of the band, as these swarthy Swedes are anything but drippy, although they might well be hippies in their spare time. As you can see, I’m a newbie to the band, although five previous albums and an EP (not to mention a ‘Best Of’ compilation) show that there are plenty of fans out there. Actually, after listening to this new album you can add me to that list of fans, because Astral Doors are very good indeed. The main stumbling block with the band is their similarity to a certain deceased rock god called Ronnie James Dio. Musically they are very much at home with Dio’s early, faster material, like ‘We Rock’ or ‘I Speed At Night’, and this can be a little disconcerting to a listener, and to really enjoy it you have to get over this and just enjoy it for what it is - good music. Vocalist Nils Patrick Johansson has a VERY Dio-esque singing voice, which is no bad thing as it enables him to seriously wail, hitting all sorts of high notes with some serious power. The tracks are all brilliantly full on with no girly ballads to ruin all the headbanging, and all are well written with massive riffs and solos that had me dragging the air guitar out of its airing cupboard. Fans of Dio, or just quality metal in general, will be delighted by ‘Child Of Rock & Roll’, ‘Pearl Harbour” and the almost epic title track that closes the album in majestic fashion. ‘Jerusalem’ is indeed a mighty album, a colossus of retro sounds that will take you back to the early 80’s and make you want to get your Mum to sew an Astral Doors patch onto your denim jacket (and give you a lift to their gig). Instead of reinventing the wheel they’ve given a it a bloody good polish and a new set of tyres, and I can honestly say that if RJD had released this exact album it would have been hailed as an awesome return to the glory days, and I say this not to take anything away from Astral Doors, but to illustrate what a great piece of work this is. Given to me by my good friend Paul Jerome Smith as a Birthday present, I soon settled down to listen to Astral Door's new album 'Jerusalem'. And after a lot of negative comments I'd read online about the album, I wasn't sure if I was going to like this new CD. I shouldn't have worried myself because Astral Doors have once again come up with a heavy melodic metal album, that any fan of Rainbow, Dio, Sabbath etc will enjoy. OK the new record doesn't win any prizes for originality, or for that matter being that different from any of their earlier work, it does however keep up the band's winning streak of making highly entertaining melodic metal albums. Songs like the infectious 'Child Of Rock'n'Roll' (big chorus), 'Jerusalem' 'Lost Crucifix' and 'Babylon Rise' hit hard but with a subtle undertow of melody that bubbles under the surface of the songs which helps wash the pain (a good pain by the way) of the songs attack away. Again the production on the album, is powerful enough to compliment the songs and the musicianship of the band members top notch. Though again the star of the show is singer Nils Patrik Johansson, whose Dio-esque vocal histrionics give each track on 'Jerusalem' a real forceful almost explosive forcefulness that sometimes you find lacking in other singers and songs. Another fine release from Astral Doors and long may they continue to write and record such strong and powerful albums.